Stand-up paddle boarding continues to blow up nationally, especially here in Florida. Today we spoke with Brody Welte of Stand-up Fitness, who in the five months since we last had him on The Fitness Buff Show has become one of the nation’s top experts on the sport. Paid a visit to the nephrologist today. Six months ago, I had no idea what that specialty entailed. Some sub-specialty of neurology, perhaps? Actually, a nephrologist is a kidney doctor. Urologists deal with kidneys, but they only take care of the surgical part. The nephrologist helps keep patients away from the urologist. If you think this doesn’t pertain to endurance athletes in Florida, think again. When you’ve had a kidney stone, as I did on New Year’s Day, you want to see the nephrologist to avoid having another. Actually, you’ll see anyone to avoid having another. The idea is for the nephrologist to take a look at your diet and determine what’s causing the problem. As I chronicled in January, this has been a frustrating process and not just because of the epic pain – worse than childbirth say women who’ve endured both – and the medical bills. As a triathlete, co-author of fitness books, and someone downright OCD when it comes to healthy eating, how could I end up with a kidney stone? I’ve learned that many healthy foods contribute to kidney stones including nuts, berries, spinach, and sweet potatoes. Too much coffee, tea, and chocolate is a bad thing, though the research is mixed on coffee, tea and other caffeinated beverages. Eating too many beets also is bad, as if there’s anyone who eats too many beets. But few people consider the role of protein. Kidneys have a tough time processing excess protein and that produces tiny particles that enable other stuff to latch onto and form a stone. From mid-2009 through the end of 2010, I was eating way too much protein – actually, whey too much protein in the form of powdered shakes. As soon as I got out of the hospital, I cut my protein powder by 90 percent, quit eating spinach and nuts and limited my intake of berries. I’ve only consumed water and an occasional glass of wine for years, but post-stone dialed up the water consumption. By the end of March, it was time for some bloodwork and a 24-hour-urinalysis. It is what it sounds like. The lab provides a large plastic jug that looks like it should contain liquid laundry detergent. It helps for that 24-hour period to have the option of working from home. Today I visited the nephrologist’s office, a truly depressing place. There were some poor folks with serious kidney issues in the waiting room, a lot of wheelchairs and tubes. The nurse asked what medications I was taking. After all, this is not a place where healthy people visit. The doctor took a look at the “StoneRisk Diagnostic Profile” the lab provided and mentioned that my calcium/oxalate levels were good. Most stones, like mine, are of the calcium oxalate variety. Foods such as nuts, berries, and spinach are high in oxalate. That’s not my problem. (Pass the spinach). Too much salt also is a problem since it causes the kidneys to dump more calcium into the urine. I eat frequently at Chipotle and have worried that Chipotle’s high-sodium burritos might be a contributor. Nope, my sodium levels are “reasonable.” (Pass the burrito bowl). My problem is twofold. 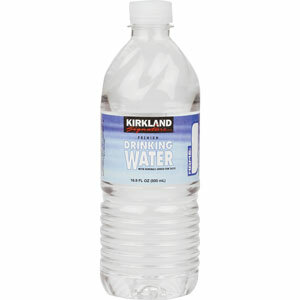 I’m only producing 1.9 liters of urine a day, nearly enough to fill a 2-liter bottle. That sounds sufficient and might not be so bad if I was a sedentary person in a cooler climate. But it’s dangerous for a Florida-based triathlete and stand-up paddle boarder. Sufficient water can take care of a lot of kidney problems; it literally washes the stone-producing stuff away. But limit the water and everything else is exacerbated. Then there’s the protein issue. Even with my diminished intake of protein powder, I still logged a 1026 on the uric acid scale in which anything below 700 is considered good. My level of phosphorus urine was 1452; anything under 1100 is acceptable. Red meat is especially bad, though I rarely eat it. I left the nephrologist’s office more puzzled than ever. I’ll dial down the protein more and drink even more water. We’ll revisit in six months. “How will I know if this isn’t working?” I asked the doctor. Our upcoming Streak the Cove 5K received some major publicity in the form of a Q&A in the RW Daily section of Runner’s World online. Editor Mark Remy asks some questions regarding the upcoming clothing-optional race at the Cypress Cove Resort in Kissimmee and about clothing-optional runs in general. With a little more than a month to go, the Streak the Cove 5K is on pace with registrations for last October’s Bare Dare 5K at the Caliente Resort near Tampa. Given the head start we got on the Streak the Cove and our enhanced marketing efforts, we’re guessing the Streak the Cove 5K could draw more runners – until the Caliente Bare Dare 5K sets a new benchmark in Year Two on Oct. 9. ST. PETERSBURG – For all of the growth in triathlon over the last decade, there are a number of races that have been around for more than two decades – and not just a little October gathering in Kona. Leave the Wetsuit at Home? Nice piece in The Tampa Tribune today previewing the start of triathlon season, which kicks off with this weekend’s Escape from Fort De Soto Triathlon in St. Petersburg and continues two weeks from now with the St. Anthony’s Triathlon, also in St. Pete, which serves as the national season opener. The story focuses on how swimming is the barrier for most would-be triathletes. The Escape from Fort De Soto Tri usually is wetsuit legal, which means that athletes can wear a wetsuit for the swim since water is typically below 78 degrees. Actually, you can always wear a wetsuit anyway but if the temperature is 78.1 or higher, you’re ineligible for age-group awards. With balmy weather in the Tampa Bay area in recent weeks, water temperatures are approaching the 78.1 mark; Bay News 9 reports 77 degrees at the moment. Either way, I’m ditching the wetsuit this year. I’m a weak swimmer and the extra buoyancy speeds me along, but I don’t like the feel of wetsuits. Plus you can make up any time lost by not wearing a suit in transition, where you don’t have to squirm out of the rubber. 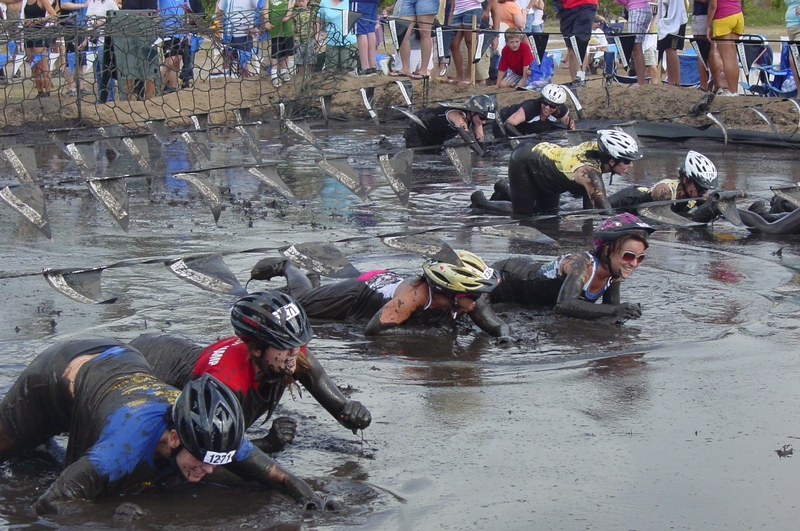 Another reason to love triathlon in Florida. Where else can a triathlete entertain the idea of racing from mid-April through the end of the year without a wetsuit? It’s not often you find a race for $20 that offers an hour-long event, a dry-fit shirt, post-race food and entry to one of America’s finest beaches, which is waiving the usual $8 parking fee. That’s all part of the package for the Shark Bite Challenge, formerly the Caladesi Kayak Challenge, which includes two days (April 16-17) of paddle races. If you can paddle it, you’re pretty much in. Not surprisingly, a large stand-up paddleboard (SUP) contingent is expected for Sunday. There’s even free beer involved during the pre-event welcome and early registration at the Dunedin Brewery from 6:30 to 9 p.m. on Friday, April 15. The race is organized by Karen Mirlenbrink, owner of the Dunedin Pilates Studio and an accomplished paddler who recently put us through a Pilates routine on The Fitness Buff Show (see video below). 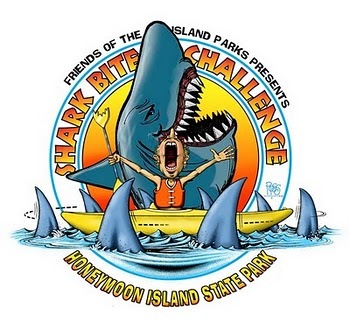 History: The Shark Bite Challenge is a fundraiser for the Friends of the Island Parks, a non-profit, citizen support organization that supports the efforts of Caladesi and Honeymoon Island State Parks. Format: Two-day event kicks off Saturday, April 16 with a nine-mile, 6-man outrigger canoe race. The following day, there’s a 4-mile and an 8-mile kayak, canoe, surfski, OC1, SUP, and prone paddleboard race. Schwag: The Shark Bite Challenge works in conjunction with the Island Earth Days festival. With registration, all racers receive a dry-fit t-shirt, lunch, and VIP seating at the festival – guaranteed to first 75 registrants. Mention the Shark Bite Challenge upon entering the park and your $8 parking fee will be waived. Signature Feature: Honeymoon Island and Caladesi Island are consistently rated among America’s most beautiful beaches.